Joshua Hahm – was injured after a freak accident at the Kids World tournament in Ontario – will make a full recovery. “Thank God his feelings started to come back last night at the hospital… And now Neuro Surgeon wants to do little further testing on his muscle damages on his neck he got from the blow… MRI came back with positive results with no broken neck or spinal damage. Thank God! He does have muscle damages but it will heal in time. Being young very flexible saved him. Thank you so much for your prayers! And sorry to cause so much worries on everyone.”- commented Joshua’s father Thomas. His father also told that his son was in tears after the injury, but not from the pain. 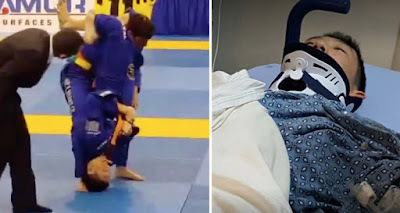 The young man was afraid his BJJ career would be over. Luckily, the young man will be able to continue the art he loves. Joshua Hahm is a two-time Pan Kids IBJJF Champion and Fight To Win Pro competitor. He is an orange belt.